Nature, art and technology: Viña Vik stunning settings make TV productions come for filming shows about hotels, gastronomy and wine. Check here! Viña Vik is an out of the World wine destination. Situated at the Millahue Valley, aproximately 2 hours south of Santiago, Chile, in the wine zone of Cachapoal, the property has over 4 thousand hectares, among 400 are vineyards. 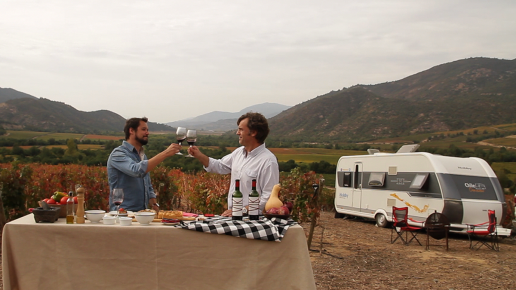 In April 2017, we’ve opened Viña Vik’s gates to TV host Daniel Greve’s stylish RV, that is weekly broadcasted at Terruá, Canal 13C’s gastronomy & wine show dedicated to showcase the best wineries in Chile. Daniel was guided by VIK’s wine master and consultant Patrick Vallete, as well as by wine maker Cristián Vallejo. Viña Vik’s chef, Rodrigo Acuña, also hosted the crew for a genuine gastronomic experience at “el huerto”, that features a common table for organic banquets.